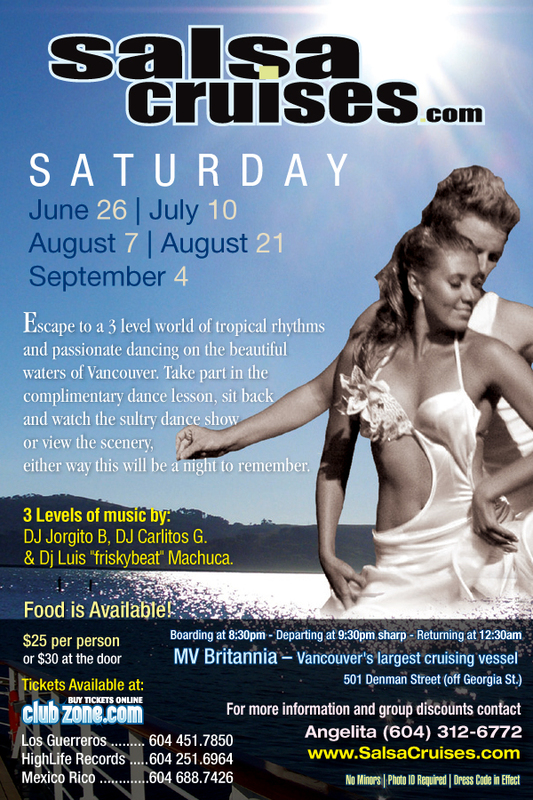 Summer Salsa Cruise in Vancouver! What better way to enjoy an evening than with a night of salsa dancing! Grab a friend and head out for a night on the water! The MV Britannia is located at the foot of Denman off Georgia Street in Coal Harbour, and is Vancouver’s largest 3 level cruising vessel, with a capacity of just under 500, where two levels are inside and the third is just under the stars. A sultry mix of Salsa, Merengue, Bachata and Reggaeton and of course some Top 40, R & B and Hip Hop also blended into the night’s music vibe. Take part in the beginner’s Salsa Lesson taught my Vancouver’s best instructors, then sit back and watch the show that follows while later testing your new moves. Dance the night away on either of the 2 levels that are covered and to cool off, venture to the 3rd floor to continue exploring the world of Latin dance. Whether you are taking a class to learn the dance that continues to sweep the world or just want that cruise around Vancouver’s stunning harbour your evening be a memorable one. Or more information on this event, visit http://salsacruises.com.